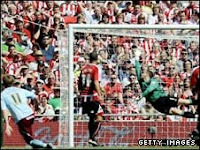 Wade Elliott's sensational strike ended Burnley's 33-year wait for a return to the top flight as they defeated Sheffield United in the Championship play-off final. 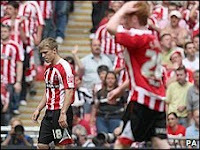 Elliott scored with a curling 13th-minute strike into the top corner that was worthy of winning any Wembley occasion. Indeed, victory for Owen Coyle's team was fully deserved as their 61st game of a long and successful season culminated in promotion to the Premier League for the first time. The Clarets, founder members of the Football League, played with freedom and ambition - and should have doubled their lead after the break but Nick Montgomery blocked Joey Gudjonsson's hooked shot while Kyle Walker made a superb challenge with Robbie Blake poised to strike. Burnley created a series of chances and went close from distance several times - in stark contrast to their Yorkshire opponents, whose best hope of an equaliser came from two penalty appeals. The first, for a challenge on Brian Howard, was debatable, but Christian Kalvenes's crude challenge on Walker after the break was a clear foul. However referee Mike Dean, whose appointment Blades boss Kevin Blackwell had criticised in the build-up to the match, sided against United on both occasions. It was a miserable afternoon for the Blades, who saw Jamie Ward red carded late on after he picked up two bookings in four minutes. But Coyle and his squad, who earlier in the campaign came within minutes of reaching the Carling Cup final, have now ensured their season would not be one of near misses with their Wembley victory. Burnley: Jensen, Duff, Carlisle, Caldwell, Kalvenes, Elliott, Alexander, McCann (Gudjonsson 27), Blake (Eagles 69), Thompson (Rodriguez 73), Paterson. Subs Not Used: Penny, McDonald. Sheff Utd: Kenny, Walker, Morgan, Kilgallon, Naughton, Montgomery, Howard (Lupoli 82), Cotterill (Ward 58), Stephen Quinn (Hendrie 85), Halford, Beattie. Subs Not Used: Bennett, Bromby.